A team of white coats at Shropshire’s two acute hospitals have streamlined their work to ensure patients are given the most effective antibiotics at the earliest opportunity. The behind-the-scenes work is proving particularly effective in The Shrewsbury and Telford Hospital NHS Trust’s (SaTH) fight against sepsis as it is now possible for patients to receive specially-targeted antibiotics within as little as eight hours of scientists receiving a blood culture. Sepsis is the immune system’s overreaction to an infection or injury. Normally a person’s immune system fights infection – but sometimes, for reasons we don’t yet understand, it attacks the body’s organs and tissues. If not treated immediately, sepsis can result in organ failure and death. Yet with early diagnosis, it can be treated with antibiotics. Through its partnership with the Virginia Mason Institute – the USA’s ‘Hospital of the Decade’ – SaTH is doing a major piece of work to increase awareness of sepsis and ensure patients diagnosed with the infection are given a bundle of antibiotics within the all-important ‘golden hour’. Alan Jackson, Head Biomedical Scientist at SaTH, said: “This ‘scatter-gun’ approach is vital as statistics show that 90% of patients given the bundle of antibiotics within one hour will survive, compared to 50% of patients who receive the antibiotics after a five hour delay. 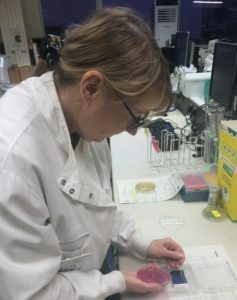 Karen Gibson, Senior Specialist Biomedical Scientist, has been leading the work within pathology, which has seen the introduction of new state-of-the-art machines in a partnership working between all grades of pathology staff. She said: “We have changed the blood culture bottles to plastic so staff on the ward can use the air tube system at the Royal Shrewsbury Hospital (RSH) and the Princess Royal Hospital (PRH) so staff on the wards can get them delivered quickly to the laboratory. We’ve had a few issues with this system in the past but we have worked closely with the teams on the ‘shop floor’ to resolve these, meaning we are now getting more than 90% of the bottles onto a Blood Analyser Machine within the four-hour target. “The Blood Analyser is an incredible machine and we are fortunate enough to now have three of them, so we can look at 480 samples a day. The machines take a reading of a sample every 20 minutes and can detect growth after a minimum of 12 readings (four hours).